One of the highlights of my recent trip to France had to be attending the Fête de la Transhumance. 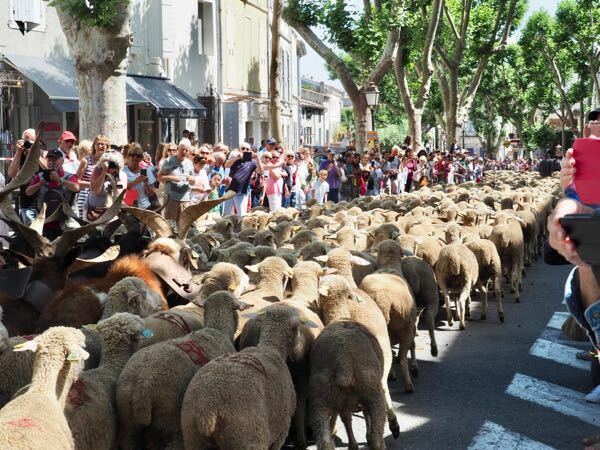 Think of hundreds if not thousands of sheep heading down the streets of St-Rémy-de-Provence. What a sight! It was also a great opportunity to meet up with author, Keith Van Sickle and his wife Valerie. We had connected months earlier when I did a review of his book, “One Sip At A Time: Learning To Live In Provence” . 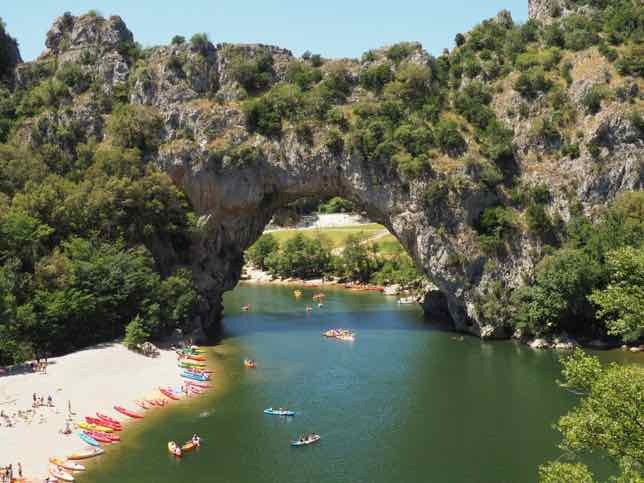 I wanted to learn more about their life in Provence and find out how they were able to assimilate with the locals. So, we arranged to meet on June 5 just before the herding of the sheep was to begin. Vendors had set up a market at Place de la République. 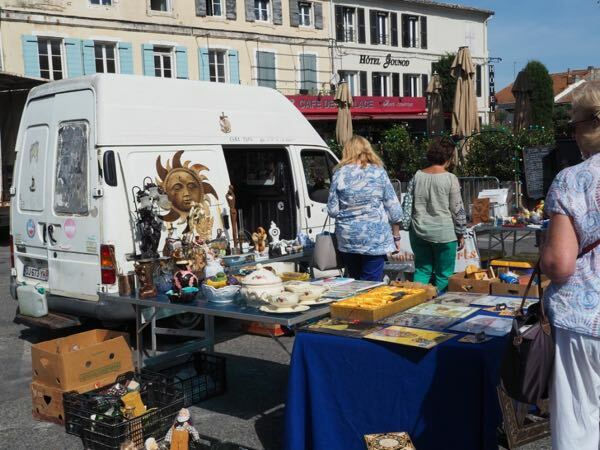 Wednesday is usually market day in St. Remy but on this particular Monday, sellers took advantage of all the visitors in town for the festival. And rightly so. There were hundreds of spectators lining the streets and before the big parade of sheep, people were browsing the market. There were a lot of brocante (flea market) dealers with items such as old cow (and sheep?) 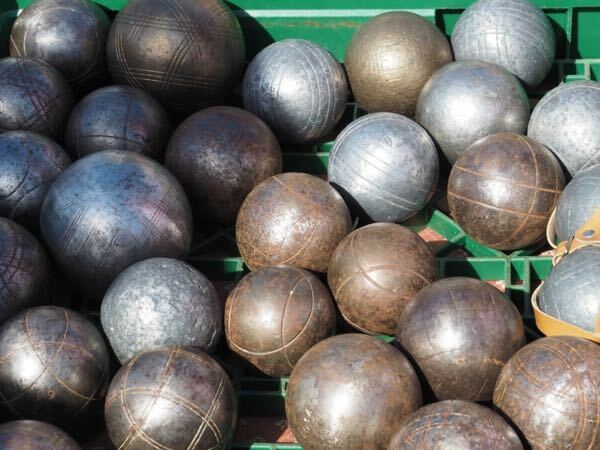 bells, leather harnesses and “very well used” boules being sold. At the same time, the market also had provencal items such as straw bags, soaps, and linens for sale. At 11:00 I met up with Keith and Valerie and it was pointed out to me that the streets were pretty clean.…..but they wouldn’t be for too long. The sheep were coming! So what was the herding of the sheep like? Fabulous, but it was over quickly. 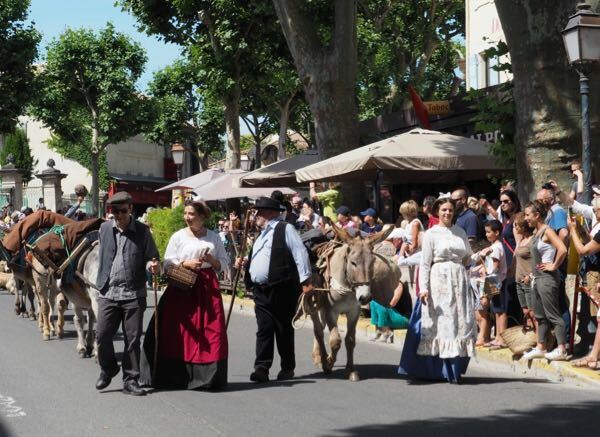 It began with a few locals dressed in traditional costumes walking alongside some donkeys and leading the “pack”….or in this case, the flock of sheep. However, every now and then you’d see some goats. The hard-working sheep dogs were there keeping those sheep in line and there were so many animals that they filled the entire street from one side to the other. We stayed on the sidewalk or else we would have gotten ‘run over”. The sheep went around an area of the town once and then about 10 minutes later they appeared again. I was told they usually do two circuits before they head up the mountain….in trucks. They are no longer “walked” up the roads to the mountains as it creates a traffic jam and in our modern era, sadly, we have impatient drivers who need to get to their destinations quickly. So, no leisurely stroll for the sheep. As quickly as it started, it was over but my fun had just begun. Keith, Valerie and I walked around St-Rémy before heading for lunch at Brasserie Les Variétés. I know it seems wrong in view of what I had just witnessed, but I had a delicious lamb dish. It was really good. I’ll leave it at that. 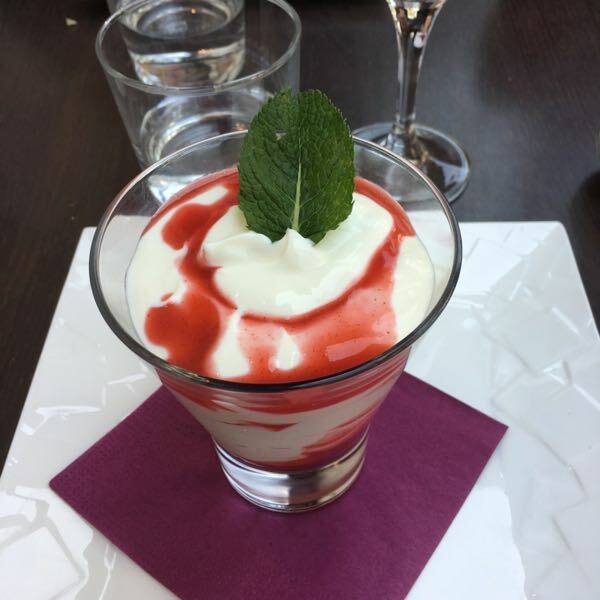 And in addition to having a local red wine, I also HAD to have my favourite fromage blanc with some raspberry confiture (jam). To me, fromage blanc is like whipped cream. It is often served with a jam or a sprinkling of sugar. Try it. You’ll like it. Over lunch I peppered Keith and Valerie with questions about how they found their house that they rent and how they have immersed themselves in the language and culture. I felt like I already knew them well based on Keith’s book. 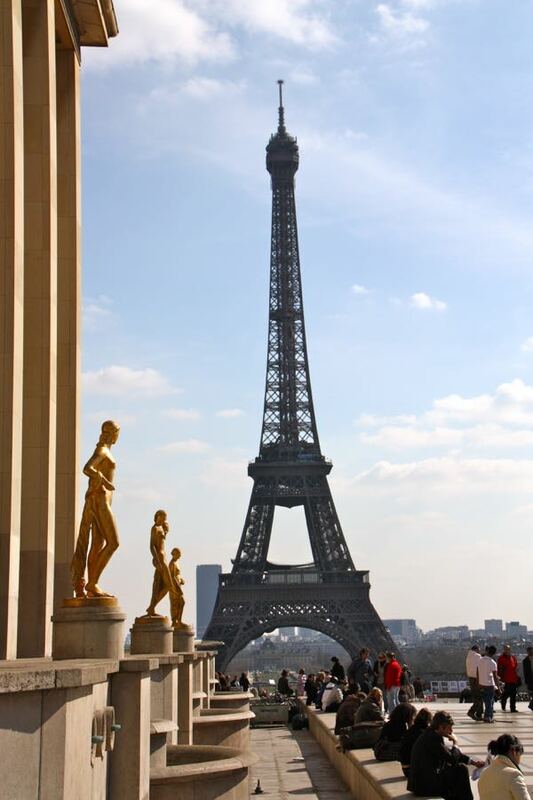 But as we talked I also realized that they love France as much as I do. It’s a rather unique thing when you meet up and start talking with people who truly love a country and culture as much as you do. Immediately there is a connection and understanding. I “get” them. I “get” how they love France because I do too. There’s no need to defend why I keep returning to France. They didn’t need to give any explanations either. Keith and Valerie are a lovely couple and I couldn’t believe how fast the 2 1/2 hour lunch went, although in France 2 1/2 hours is a ‘quick” lunch. Instead of saying “goodbye” we said, “à bientot”, as I am sure I will be seeing Keith and Valerie sooner than later. I will be returning to Provence again….and not to just see sheep. It was so great to meet you! Val and I look forward to our next rendezvous! That’s interesting that they do that daily. That would be cool to see as well. Transhumance looks like fun! Such a sea of sheep, but it’s the flea market that appeals to me most. Love the tradition…and the markets too! Maybe it’s because I’ve always lived in cities, but I get a big charge out of seeing cows, goats, sheep, donkeys and even horses grazing in the fields near where we live in Portugal and being tended by caretakers. 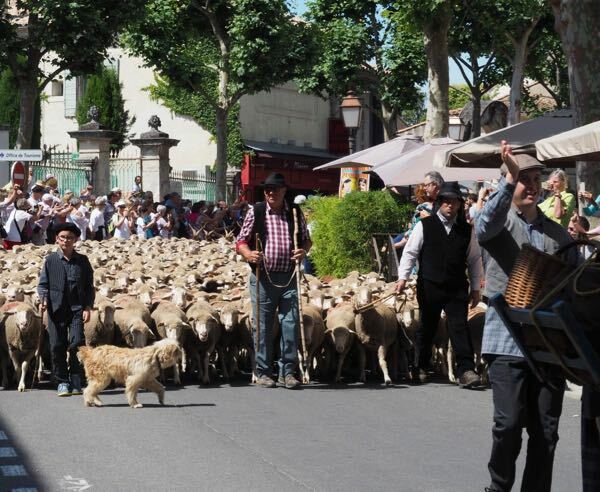 I would have loved to have seen the Fête de la Transhumance and the parade of the sheep through the town with some of the people wearing traditional dress. It’s too bad you weren’t able to see the sheep dog training exhibition as that would have been interesting and fun to see too! Yes, I kind of regret not seeing the sheep dog training; however, there’s always next time! 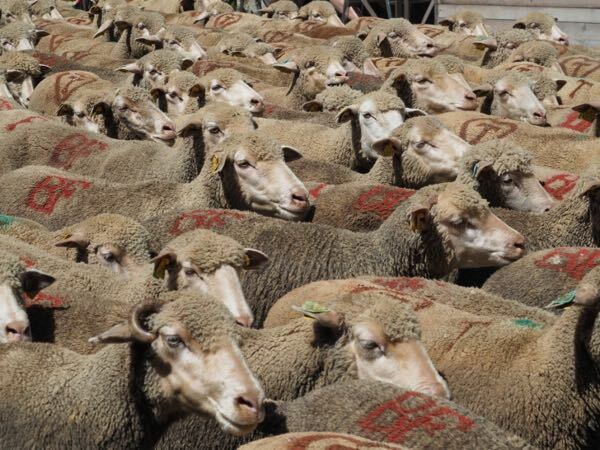 Well worth planning your visit around the Transhumance – I’d love to see it someday! It was really quite the event. How wonderful to be in St. Remy during the Festival. Your photos sure capture the excitement of a beautiful day! Felt so lucky to be in Provence just at the right time! How fun! It’s hard to believe the sheepdogs can keep all those sheep moving along together — I imagine them bolting and heading off in all directions! 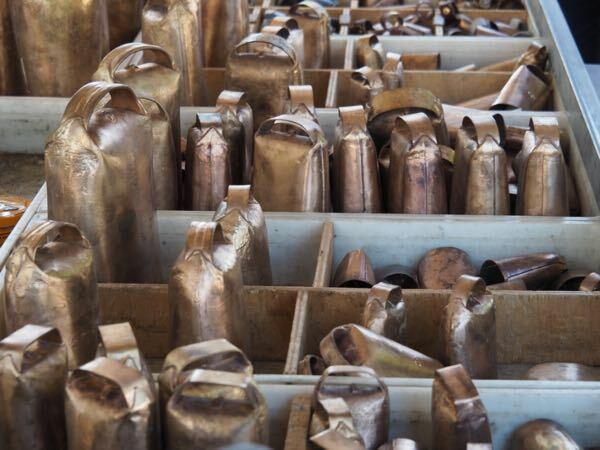 Yes it’s amazing how orderly they were. I love those old traditions. It must have been amazing to see so many sheep walking along the streets! LOL! I love that you had a lamb dish after the whole sheep parade thing! Dramatic irony at its best! True. But I did feel a bit guilty. What a wonderful adventure! So nice that you got to have lunch with Valerie and Keith. I know first hand what a charming dining companion you are. That video of the goats going through town is priceless! This is the kind of thing I love most about travel. These kinds of super-local events, with history and tradition to give them depth. And done especially by and for the local people, not just for tourists. Nice post! Thank you. It was one of the highlights of that trip!